Size approximately 57 inches across and 43 inches on a side. 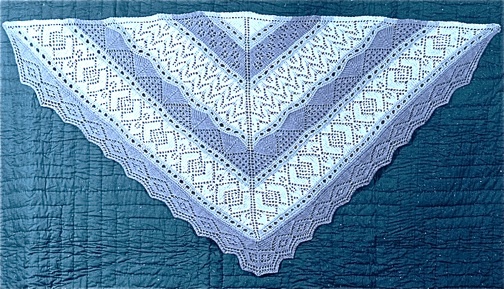 Knit from the center back out and down, this shawl has rows of delicate lace patterns separated by rows of simple dewdrops. The kit is available in Natural Cream or Natural Light Gray. If you prefer a dyed color, this shawl requires two skeins of Blackberry Ridge Lace Weight Yarn. The colors pictured are Light, Medium and Dark Wedgewood in 100% Wool.